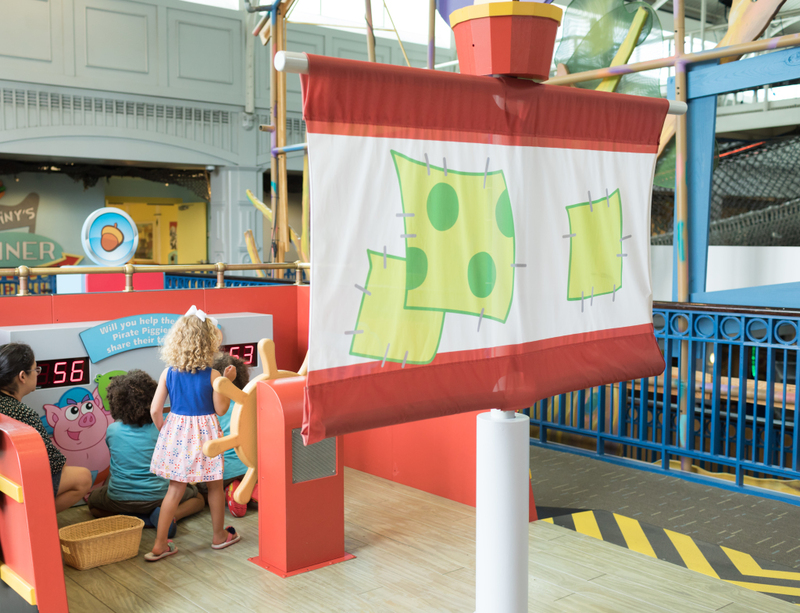 Dora & Diego Exhibit at Port Discovery + Ticket Giveaway! 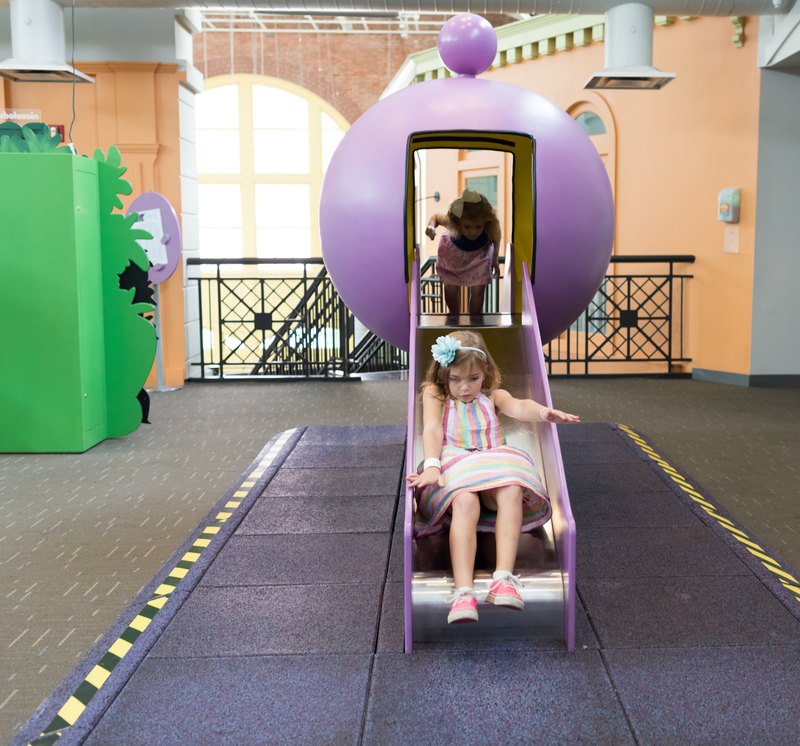 Port Discovery Children’s Museum in Baltimore’s Inner Harbor offers three floors of interactive, educational exhibits and ever-changing programs for children ages birth through 10. I’ve been taking my girls here for a few years now and they always have the best time! We visited last weekend to check out the new Dora & Diego: Let’s Explore exhibit that is open now through February 19th. It’s time for adventure when children and their families come to explore Nickelodeon’s Dora and Diego—Let’s Explore! 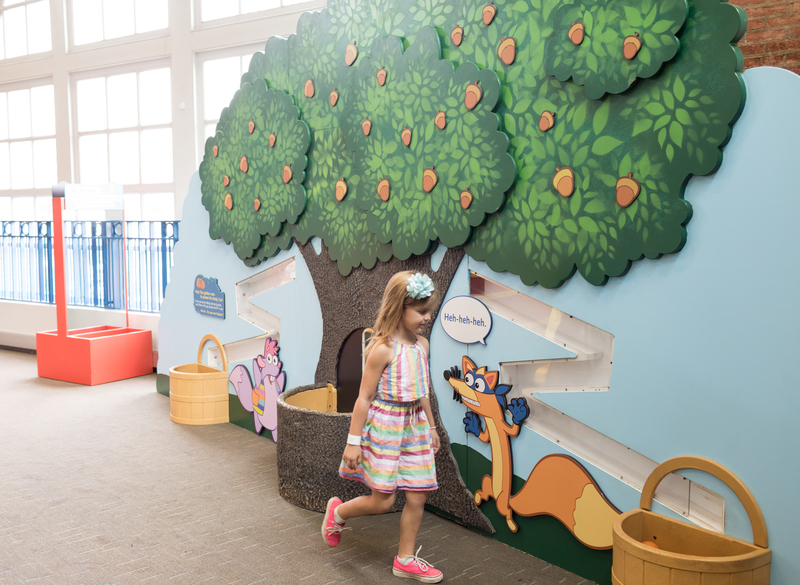 This interactive exhibit takes visitors on an active adventure in the enchanting world of Dora the Explorer, her animal-rescuing cousin Diego, and their friends. 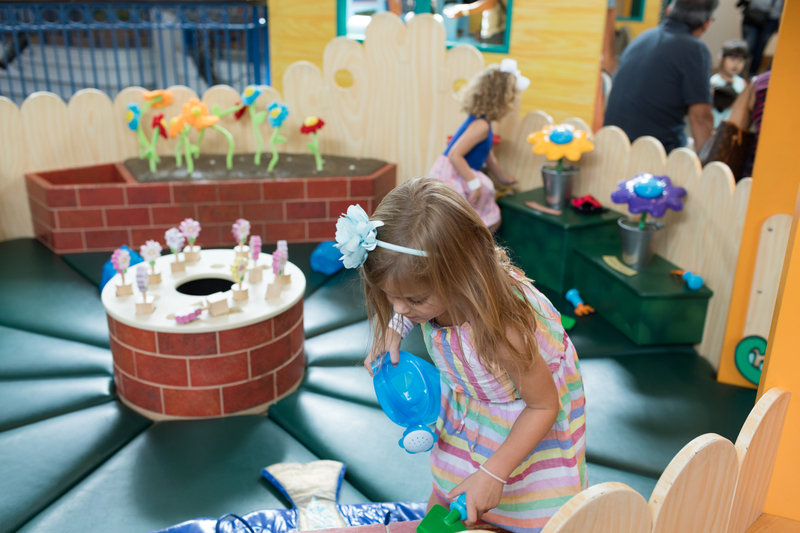 Explore Isa’s Flowery Garden, help Tico gather nuts, join the Pirate Piggies’ crew to uncover pirate treasure, and help baby animals in the Rainforest Maze. My girls headed straight for the Rainforest Maze once we entered. 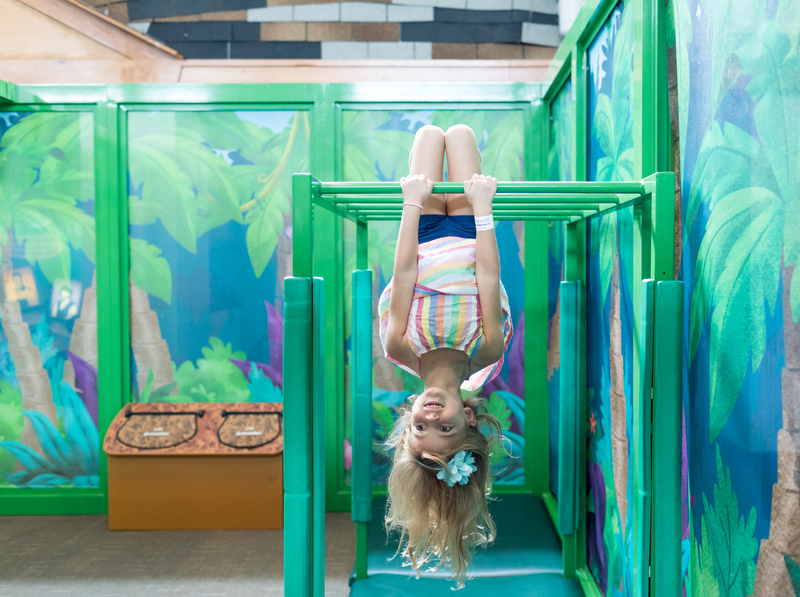 In this part of the exhibit kids can locate rainforest animals, swing across monkey bars, jump and hop across River Rocks and more. In the Animal Rescue Center, little ones can care for baby animals. If your child likes to role play, they will love this area. They can scan an animal to find out if it needs their help. Or if the animal needs a check-up they can listen to its heart, look inside of its ears, or apply a cold pack. 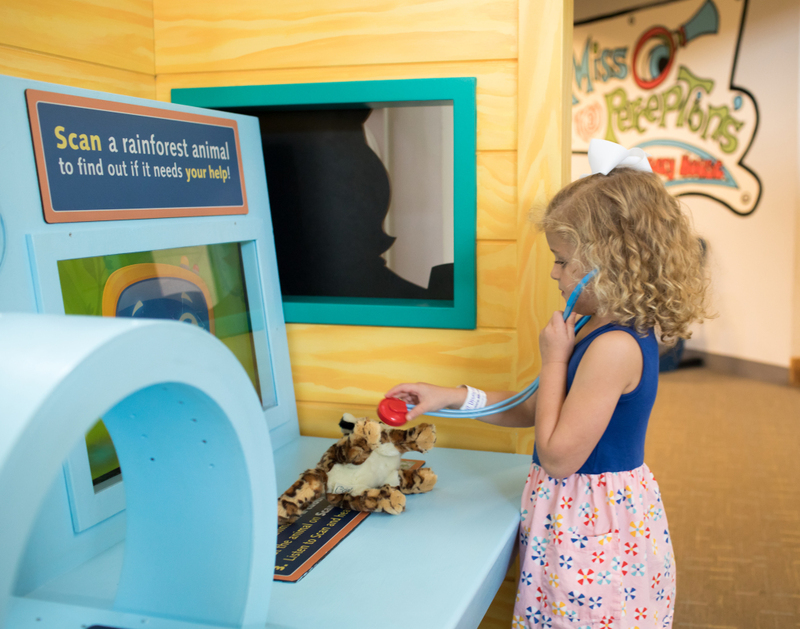 In another part of the exhibit, kids can help Tico collect nuts to power his family car. My girls loved scooping up the acorns that were falling into the basket and then loading them up in the gas tank. Swiper, the sneaky fox makes an appearance here as he tries to swipe the nuts! Next to this area is the Pirate Piggies ship where kiddos can pretend to sail the high seas. There are even pirate clothes that the children can wear to dress the part as they play! Parents are encouraged to help their children count the Pirate Piggies treasure in both English and Spanish. In the Flowery Garden, kids can help Isa tend to her garden. This area has a padded floor, so its a good space to explore if you are visiting with a baby who might want to crawl around. 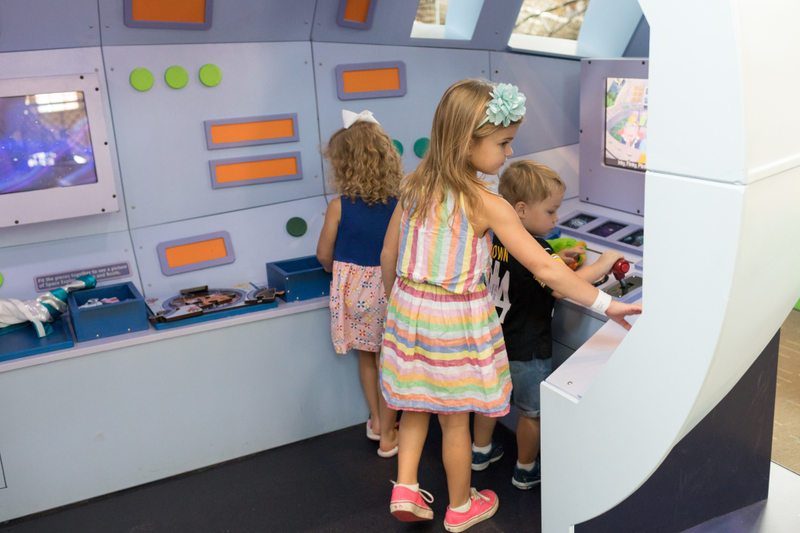 In the rocket ship, little ones can put on a spacesuit and pilot the ship! Just across from the rocket ship is the Purple Planet, where kids can climb up and slide down. 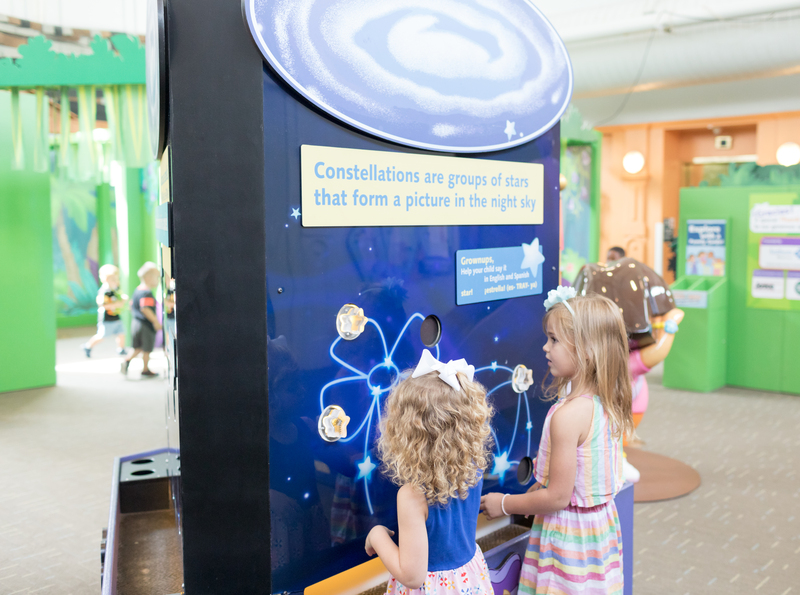 There’s also an area where children can form a constellation with glowing stars. 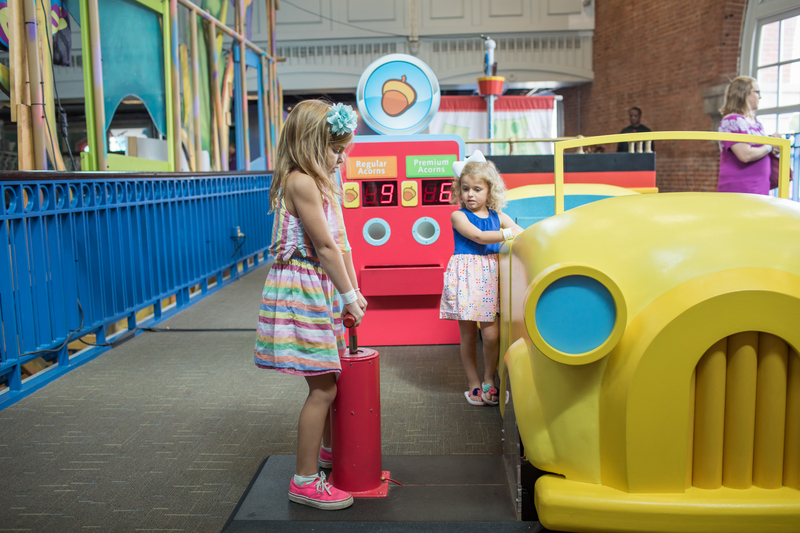 There is so much to do in this exhibit, your kids can easily spend an hour playing in just this one area of the museum. I love the educational aspects of this exhibit and its opportunities for role-playing, problem solving, and learning words in Spanish. Make sure to get to the museum to see the exhibit while its on view through February 19th! It would make for the perfect outing on a rainy or cold day this fall or winter! And if you haven’t yet visited the museum and are interested in finding out more about all it has to offer, check out this article we wrote for Mommy Nearest. GIVEAWAY ALERT! 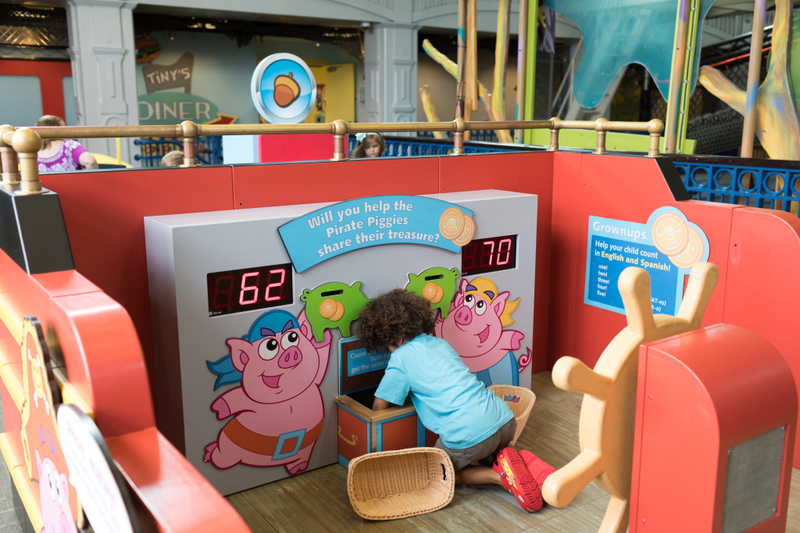 I’ve partnered with Port Discovery to give away a family 4-pack of tickets to Port Discovery which includes admission to the Dora & Diego exhibit. To enter, simply leave a comment on this blog post. I’ll draw and notify a winner on Tuesday, October 10th. Good luck! • The exhibit is best for ages 1 to 7. • Admission to Dora & Diego: Let’s Explore is included with general admission tickets to Port Discovery. $14.95 for adults and children 2 and up, and free for Museum members. • The best place to park is Harbor Park Garage – 55 Market Place. 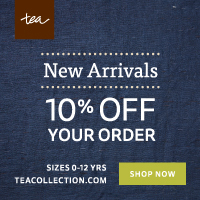 Ask for validation before leaving the museum to get a discounted price. • Port Discovery is a stroller friendly museum. • Food and drinks are prohibited in all exhibit areas, but there is a designated eating area available. • There are also lots of different restaurant options right outside the museum where you can get lunch or dinner. 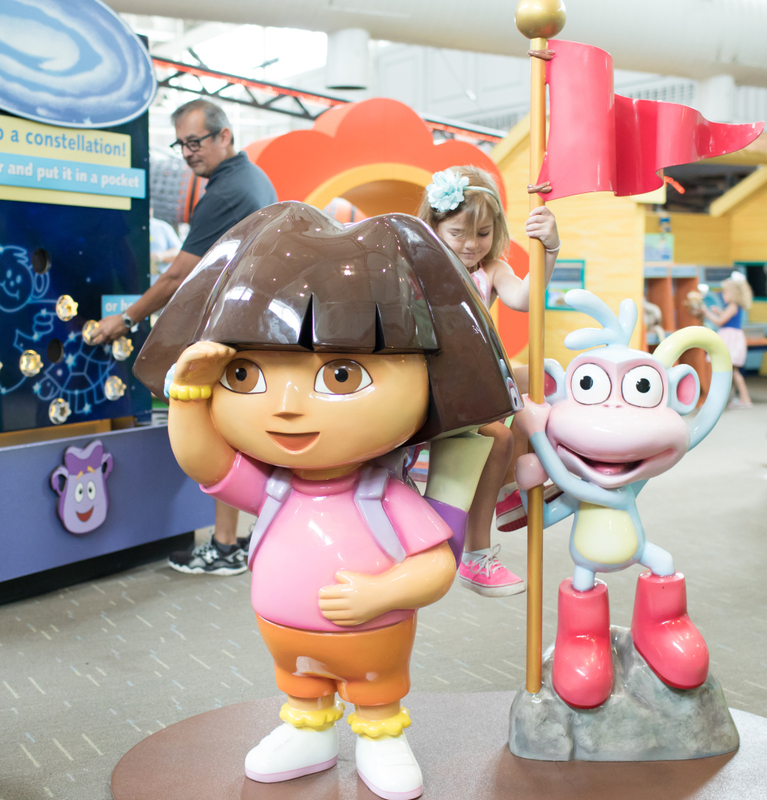 33 Responses to Dora & Diego Exhibit at Port Discovery + Ticket Giveaway! We visited this museum last winter and had a wonderful time. We’d love to go back again! Would love to take my grands back there again ! Thoroughly enjoyed our visit there before . I hope soon to visit this place , we love the educational places and I can see it’s a lot fun. I’d love to visit this museum for first time with my kids!. Your photos have me sold! Looks like a blast! We would love to take our kiddos. Would love to take my daughter there. Looks like a fun place for her to explore! I think my son would enjoy this! We would love to check it out! My girls love Dora. We’d love to go there! Thanks! We would love to win! My girls love Dora! We love Port Discovery but haven’t been in years! The new Dory exhibit looks adorable! This sounds amazing! The kids would love the rainforest maze! We have never been to Port Discovery, so this would be a treat! Plus Siya used to have a crush on Diego when she was little lol! We love Dora! Looks like a great exhibit! We would love to visit Port Discovery again! Thank you! Would really love to go there with my daughter, looks like an awesome place! I would love this for my family! We went a few years ago and it was fun fun fun! Sounds like the perfect activity for the long (pregnant + a toddler) winter ahead before baby #2 comes! Exhibit closes just before our due date so we would love to make this a special trip for the soon-to-be Big Sister! We love PD! It would be a treat having this family going there again! Thanks for this wonderful opportunity! We’ve been meaning to make a trip here, we would love to go!! This looks like so much fun! Thanks for keeping us in the loop with fun opportunities for our area! My 3 year old loves acorns! He would get a kick out of using them to power a car! That’s awesome! Looks like a great place for kids! It would be a blast for my 2 little monkeys to experience this place. It looks like it would be a fun educational experience!! My hubby and I would love to share this family event with them. Please consider us!! Thank you!! My 4 year old son loves Dora! I would love to take him here to visit. This would be a nice outing for my son and one of his little friends. He adores Dora. PD was huge hit with my older kids…. Can’t wait to take my littlest and this would be great opportunity. The! !